Trying my hand at a build thread to document, albeit very slowly, the progress on a car. 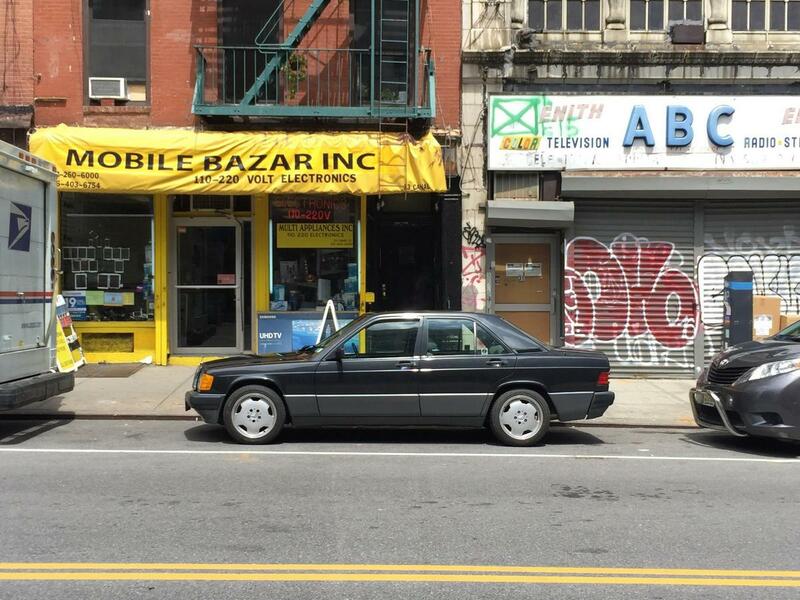 This is my first W201 and first Mercedes. 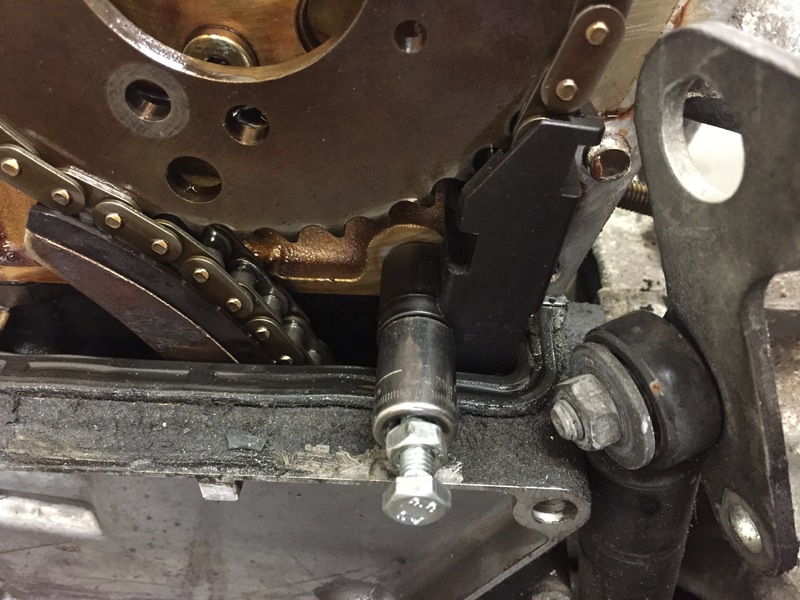 We live in NYC where car ownership is pretty unnecessary, let alone car projects, and where the simplest things like finding a particular metric bolt can be a triumph. Updates will come slowly, but I figure since this forum is pretty sleepy with posting…I’d post slowly. Hoping people find this entertaining and informative, and I’m hoping I can learn from anyone with more experience than me that wants to chime in. So, I have this car. Its a 1991 190e 2.6L w/ a manual transmission from the factory (717.432). The engine is slowly dying but it's chugging along. It's burning oil and something is causing the CIS-E to remain in open loop, but that's another thread. 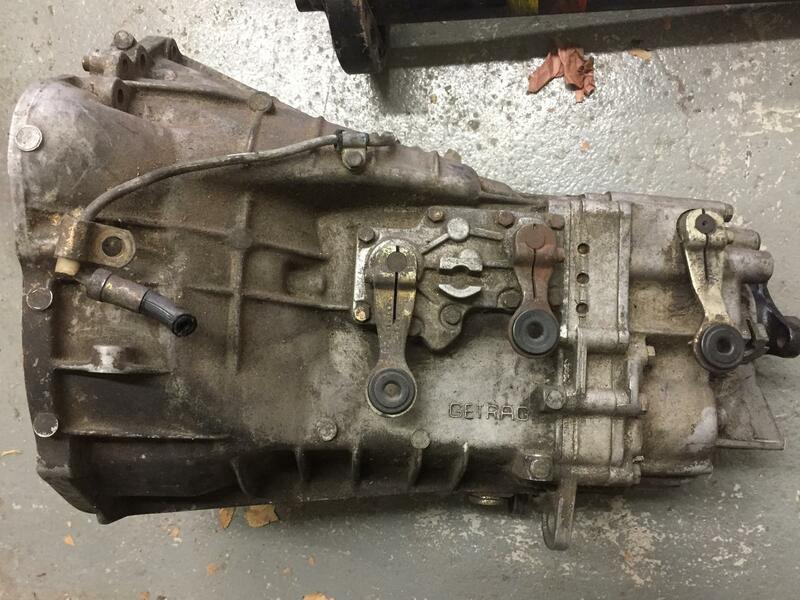 And I have this transmission, a 717.404 from a 16V that allegedly had ~60k on it before being totaled and parted out. And lastly, I have this engine, a 1987 3.0L M103 (103.983) with 46k miles on it. 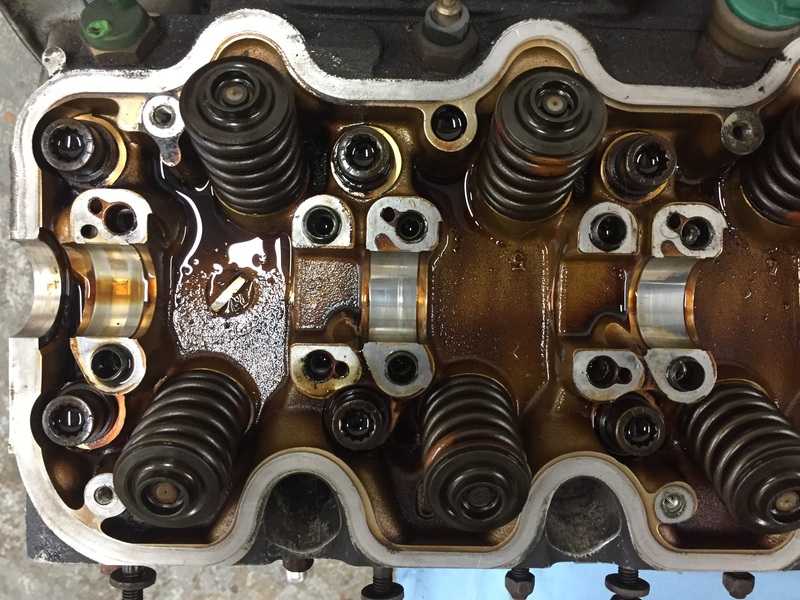 I wanted to first examine the health of the engine so I pulled the valve cover to examine the cam and rockers and also conduct a leak-down test to see how each cylinder was sealing up. I know there are conflicting opinions about conducting leak down tests warm or cold, and most sources suggest conducting them warm. Since this engine is out I’m gonna have a hell of a time warming it up so a cold test it is. Pulling the valve cover off an engine for the first time never gets old. 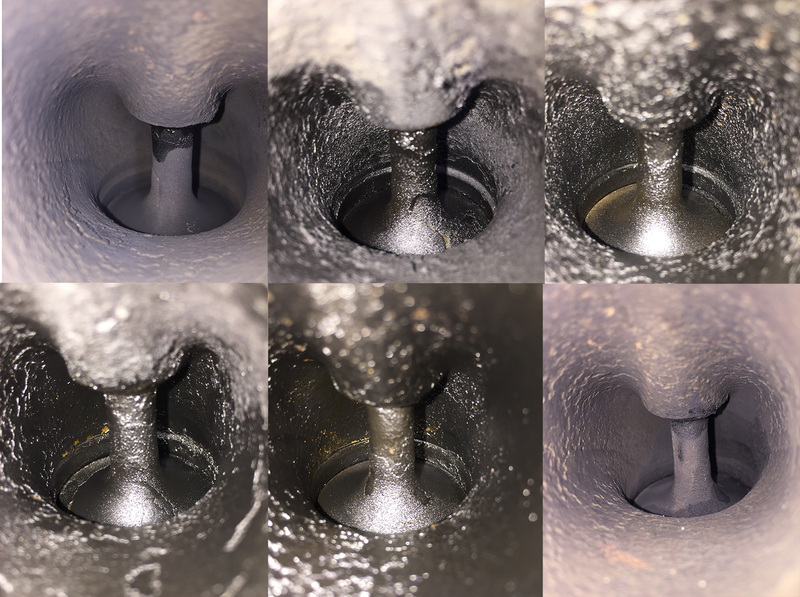 It’s the easiest thing you can do to marvel at the inner workings of an engine. 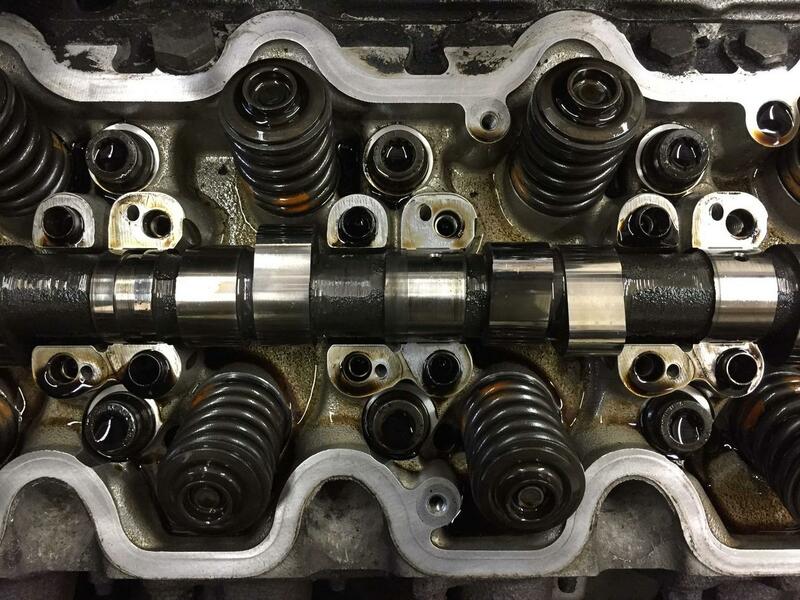 Initial inspection of the cam lobes (looking past the towers and rocker arms) looked promising. I’ve recently learned of the softer cam/rocker material used in these early m103’s. On to leak-down tests. 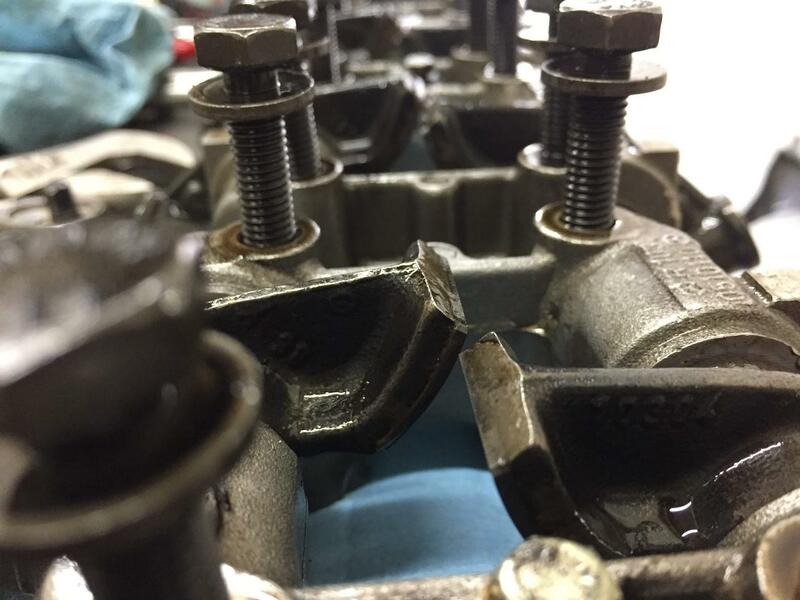 I don’t have any photos of the actual leak down testing because I had one hand holding the wrench on the crankshaft to prevent the engine from turning over, and the other hand was struggling to connect the air fittings. The results were a bit disappointing. 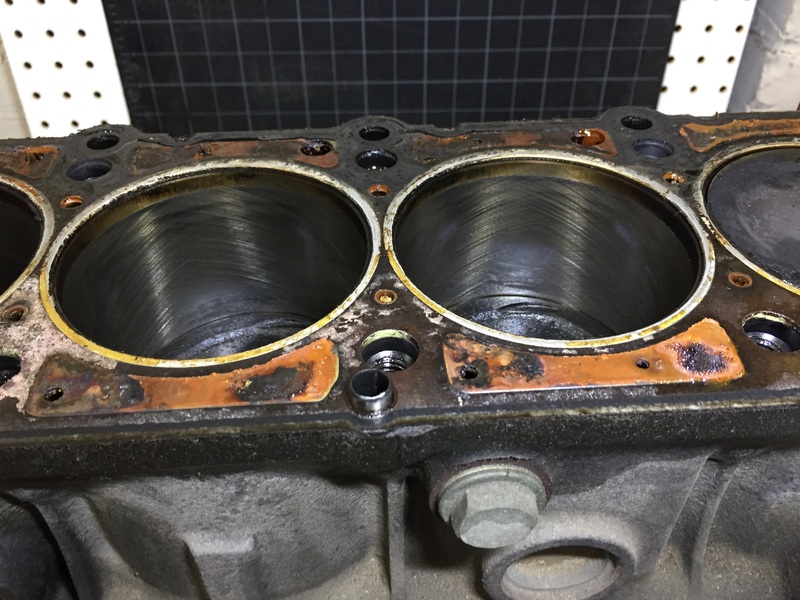 I conducted the tests multiple times and got pretty consistent results, even after a squirt of oil into the cylinders and "rocking" the piston around TDC. The air leakage was very obviously at the exhaust manifolds, which were still attached at the time of testing. 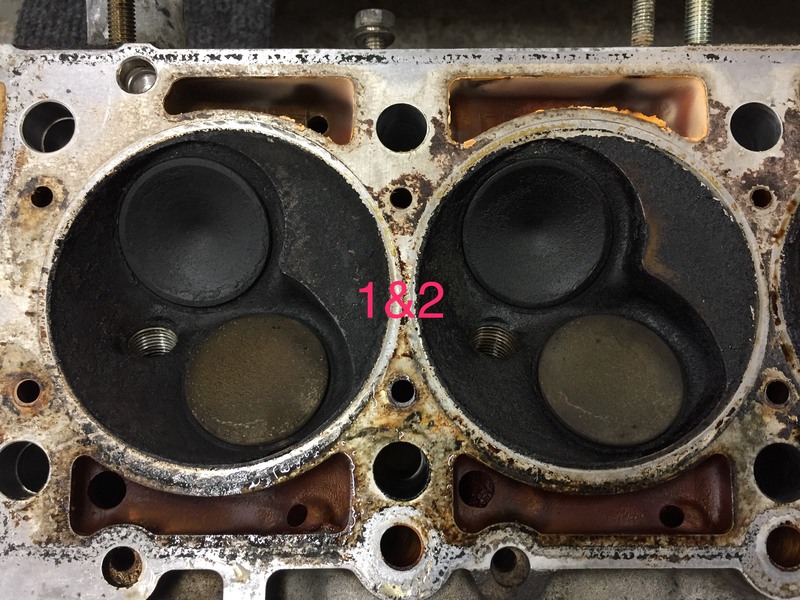 I could feel and hear the compressed air leaking past the exhaust valves. 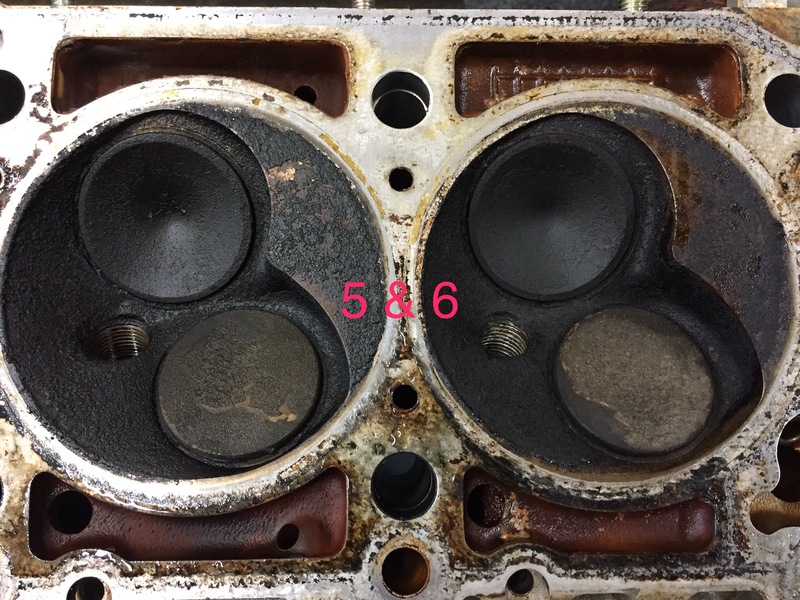 I then had a second look at the plugs and 2-5 were slightly oilier than 1 & 6, another clue pointing to the health of cylinders 2-5 that correlates with the leak down tests. 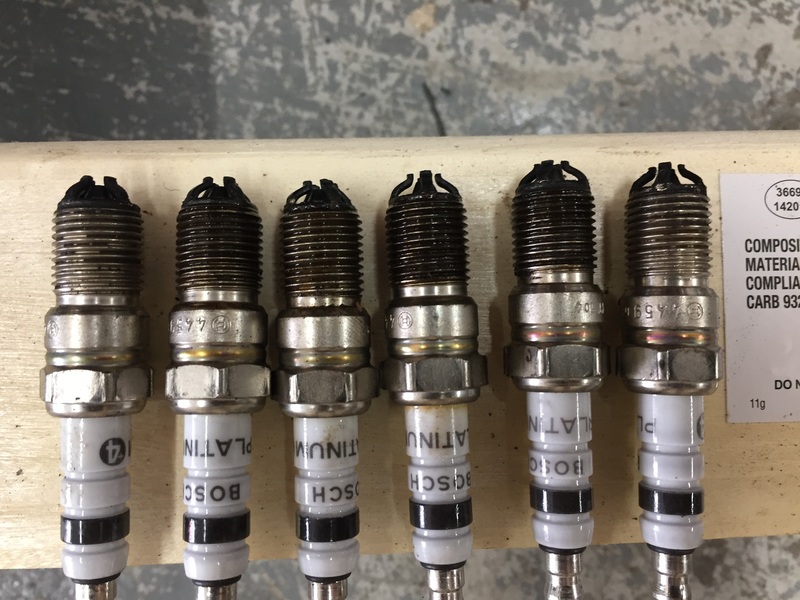 That's plugs from cylinders 1-6, from left to right. Notice how 1 and 6 are slightly drier. At this point I'm asking around for machine shops in the area for a valve job, and I went forward with the disassembly. Rocker arms and bearing surfaces look great. 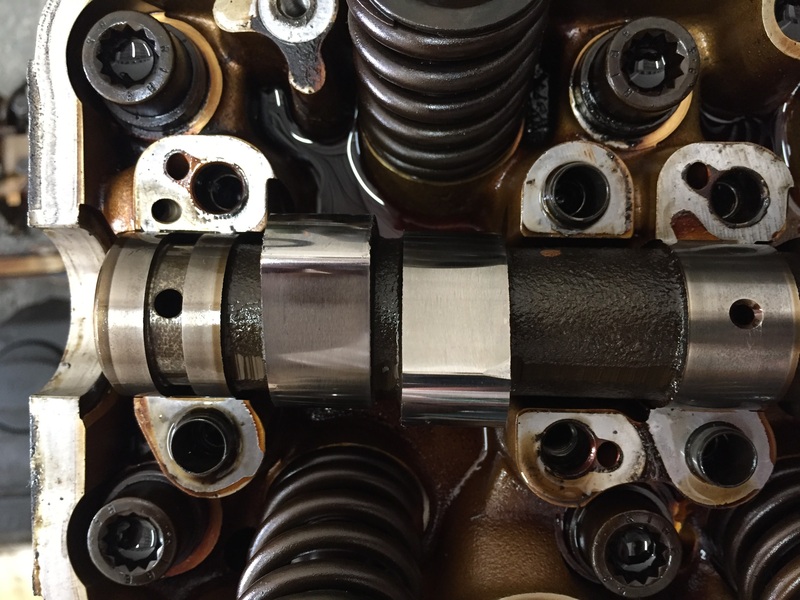 No scoring or marking on the camshaft lobes or journal bearings. The lobes still have a mirror finish. It’s a shame these are most likely the earlier softer cam and rockers. How does one definitively ID the softer cam and rockers? 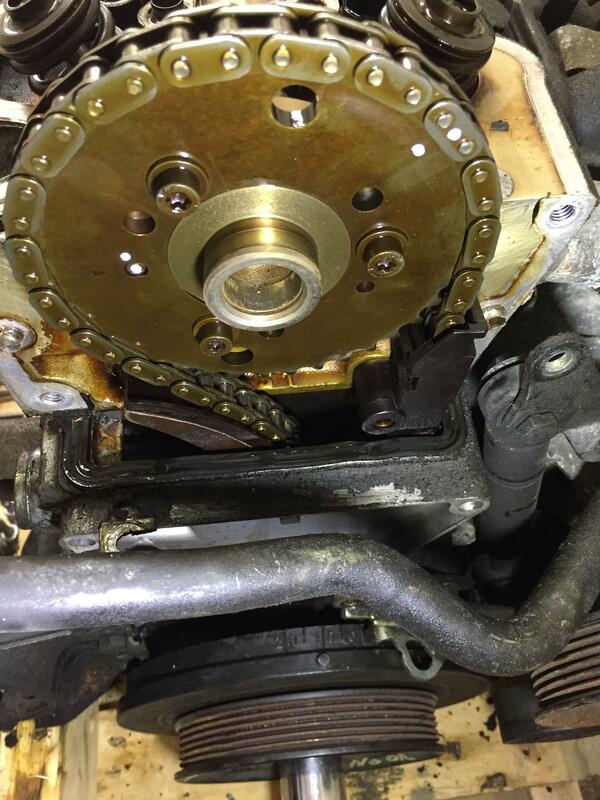 Inspecting and removing the timing sprocket, chain guide pin, and removing the camshaft. 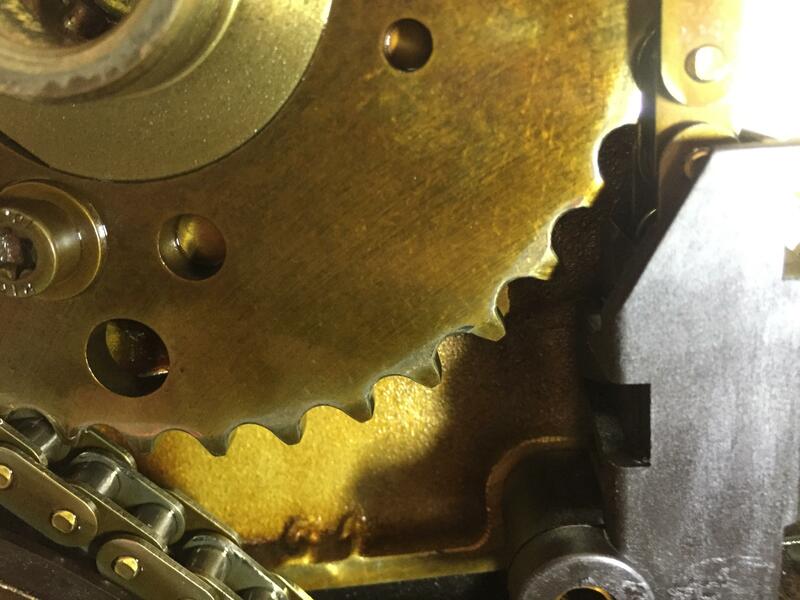 Chain and sprocket look good. Off with it's head! Happy to see the cross-hatching is still present in the cylinders. A look at the valves on the underside of the head didn't reveal any severely burnt valves. I'm hoping it's just carbon build up that's preventing the valves from seating pproperly. 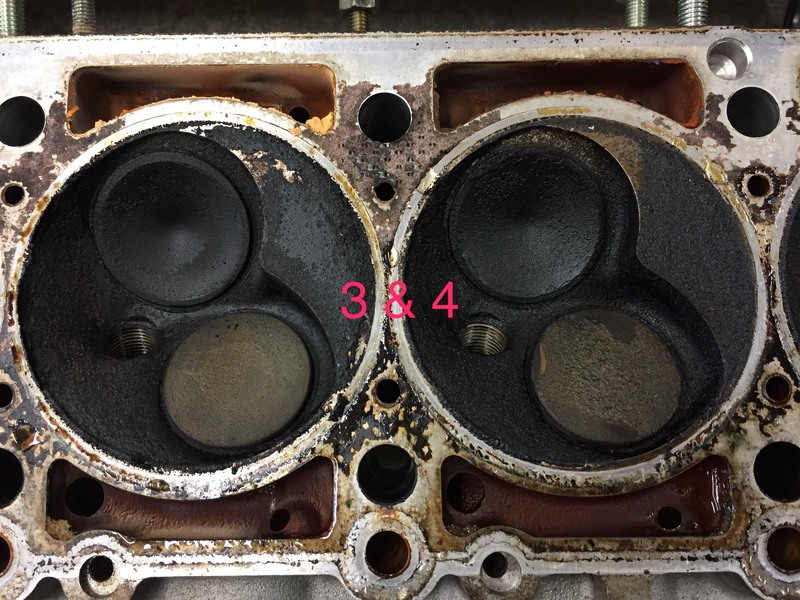 Cylinder 5's 80% leakage had me expecting much worse. That's about all I got done this weekend. I'll need to find a machine-shop in the area to do the valve job, cleaning, valve guides, stem seals, and possibly resurfacing. 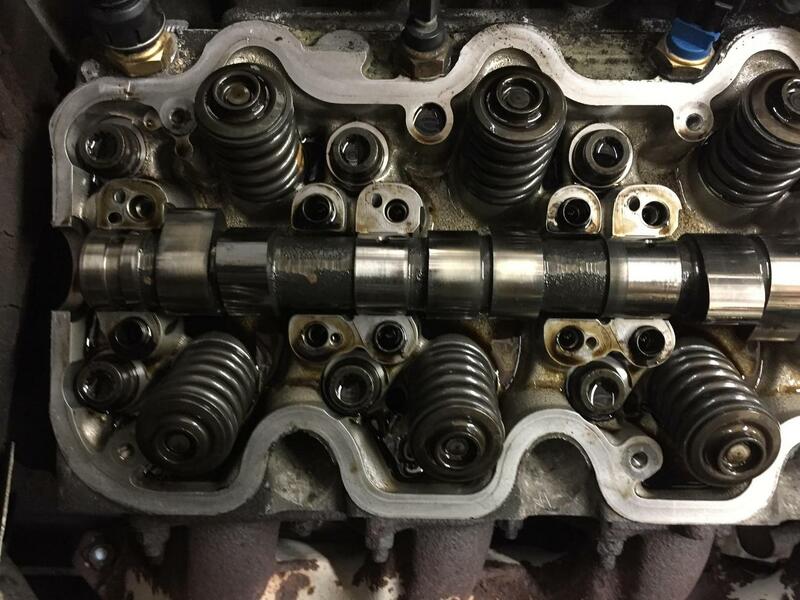 I had initially considered putting in a mild dbilas cam, but I'm now having a hard time justifying the cost of 12 new hardened rocker arms, especially since the stock cam and rockers are in such decent shape. 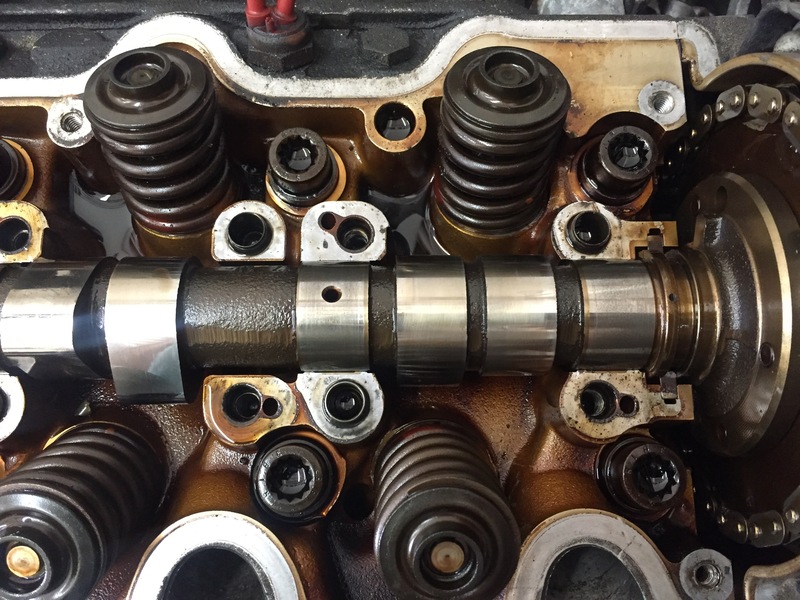 Another option is I could also look for someone to regrind my 'soft' cam but don't know if it's worth it to alter these camshafts. Last option is just to put the stock cam and rockers back in and be ultra mindful of oil levels and use a good high zinc oil. The car is only a weekend driver after all. In any case I have some time to decide on the cam and rockers while I wait for the valve job. Beyond this engine work I'll be mating the getrag dogleg to the motor, most likely using JC's flywheel and clutch kit. More to come on that soon. Here's a parting shot of the car parallel parked in its native NYC habitat on Canal St.
Last edited by rolandtiangco; 07-23-2017 at 08:11 PM. cool project, nice looking 2.6! i commend your effort to build one out in nyc. 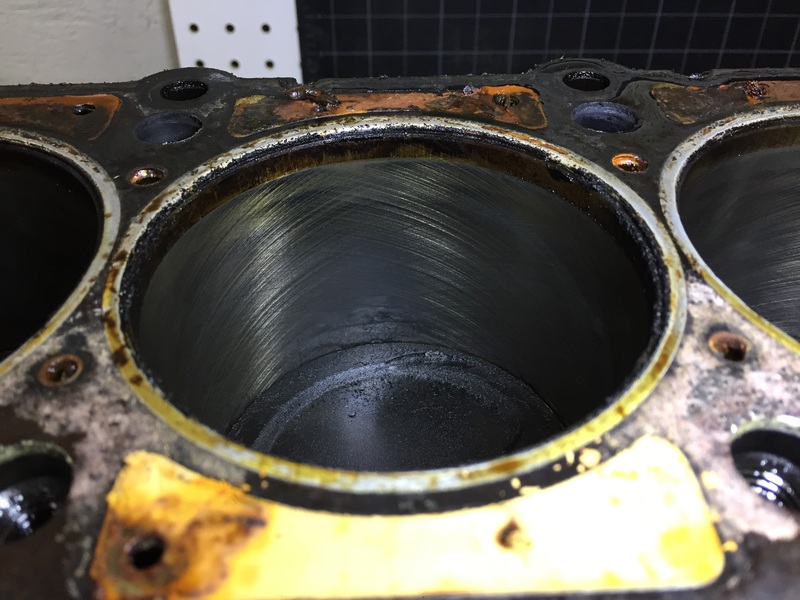 looks like that engine's valve stem seals let go a long time ago, pretty common in those 103's. 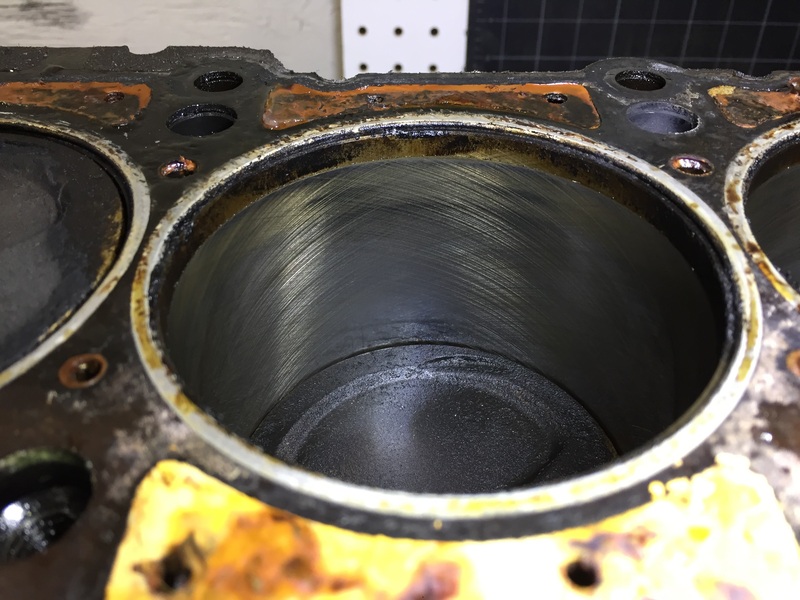 while you have crosshatch still in the cylinders, i do see some shiny spots that have most likely been caused by the excessive oil in the cylinder and will continue to cause high oil consumption and blow-by when put back together if not addressed. a quick hit with a ball hone and new rings should do you well in that engine. 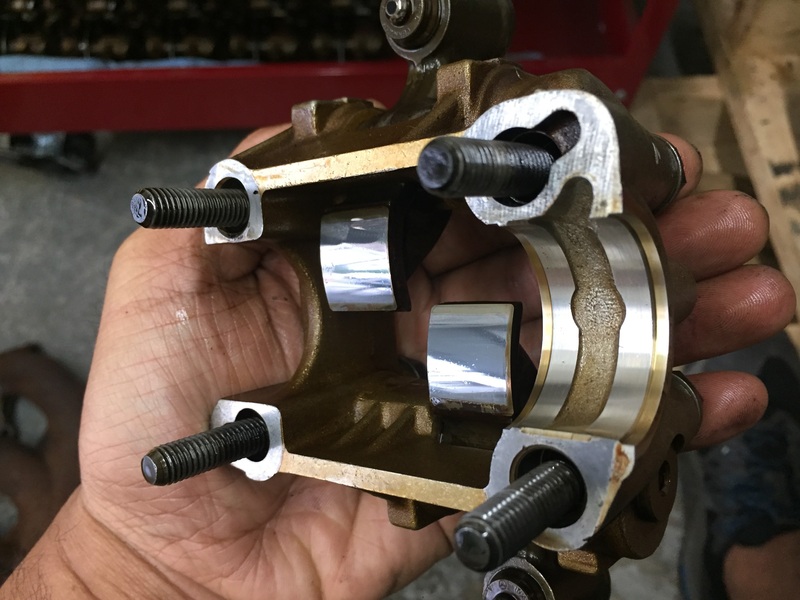 if you need bearings, get the crank ground down to the first repair size and use a repair bearing set, it is cheaper to go that route than to color size every journal and buy the bearings onsie twosie. it's either $50-$70 per bearing pair to color size, or $80 for the repair bearing set and around $200 for a crank grind. Thanks man. And thanks for the tip on the cylinders. I'll have to look at them again when I'm back to my garage. I was shining a flashlight on them while taking those pics hence the shiny spots. I'll closely inspect them for glazing this week. 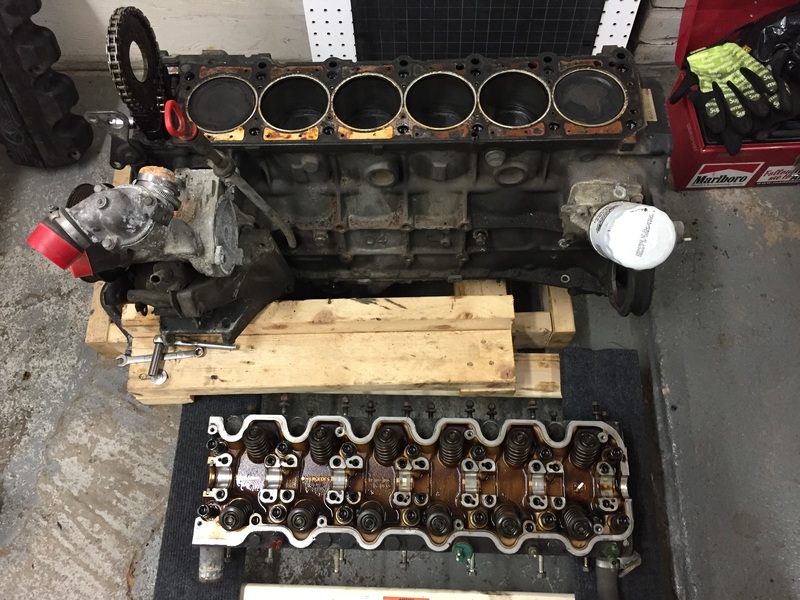 I don't have an engine stand (yet) so I'll need to figure out a way to safely flip the block over to get the oil pan off to inspect the crank bearings and pull the bottom-end apart for rings if it looks like they're needed. Roland! Awesome to see the build get going. Definitely wouldn't bother with the cam if I were you. 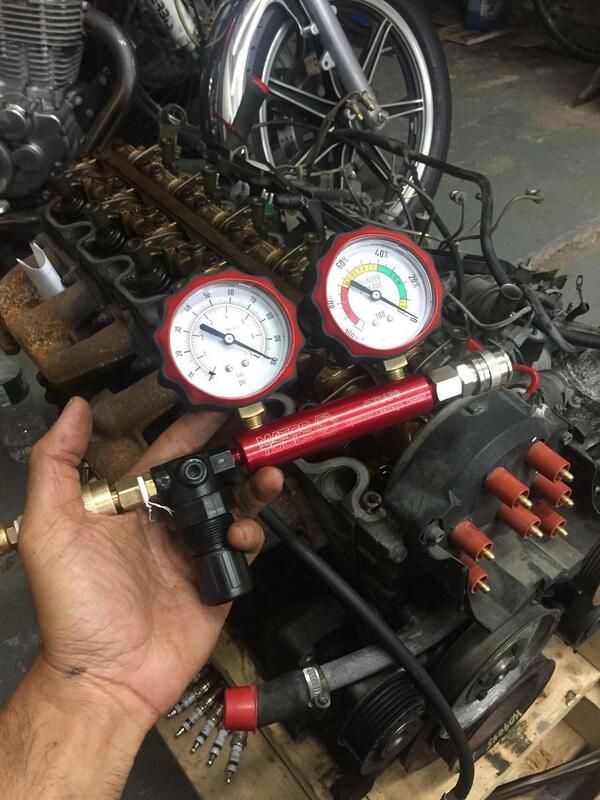 The guys at Chander Auto on the upper east side have a good machine shop they work with. I'd start there. They're honest guys and their prices are very reasonable. I second that, Chander sent my 16v head to their machine shop for a rebuild and my 16v runs better than ever. Thanks Emre and Kiato. I'll be calling Chander this Monday for their recommendation. Slight tangent...Got an extra set of valve stem seals to change the ones in the 2.6L currently installed in the car. It burns oil, so I've had this on my list of things to do since I'm going to continue driving the car while I prep the 3.0L for the swap. 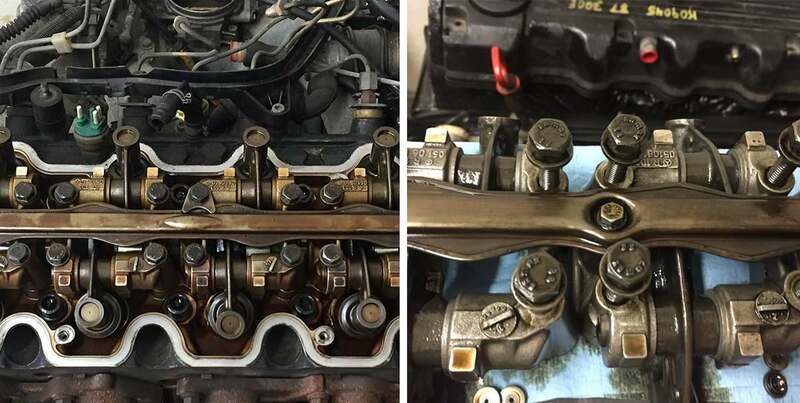 After pulling the valve cover off the 2.6L I immediately noticed the visible difference in color of the bits compared to the bits in the 3.0L. You can see the earlier stuff is kinda bronze in color compared to the later 2.6L, which is more silver. Updated oiler rail has an additional bolt to hold it down in the middle, instead of the clip attached to the rocker tower bolt. Earlier design on the left and updated on the right. In this shot you can make out the updated hardened material (carbide?) welded onto the rocker arm. 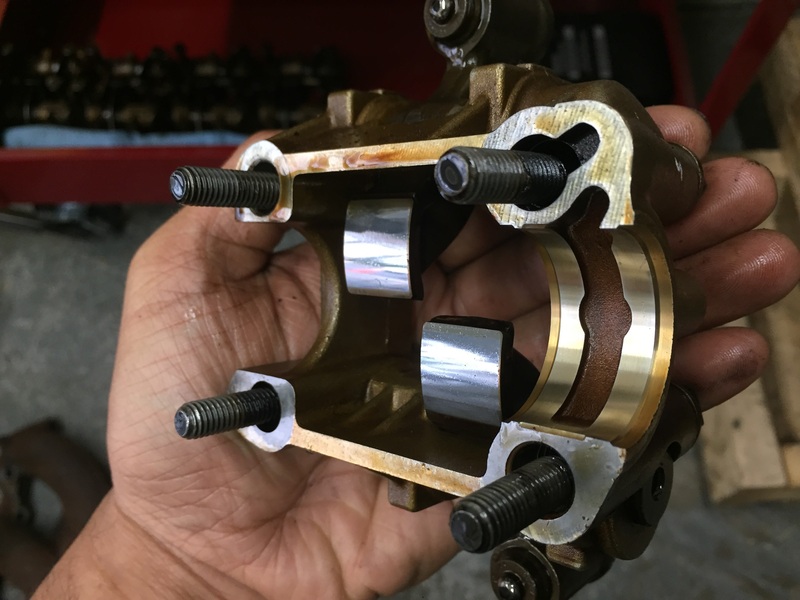 Cam lobes were in pretty good shape for a 200k+ mile car. Only some minimal and very very light scoring on one of the journals, barely detectable with my fingernail. I wonder if this engine was ever rebuilt. I do know there is an MB factory rebuilt fuel distributor on it, and that the car was often dealer maintained. I guess that will remain a mystery. 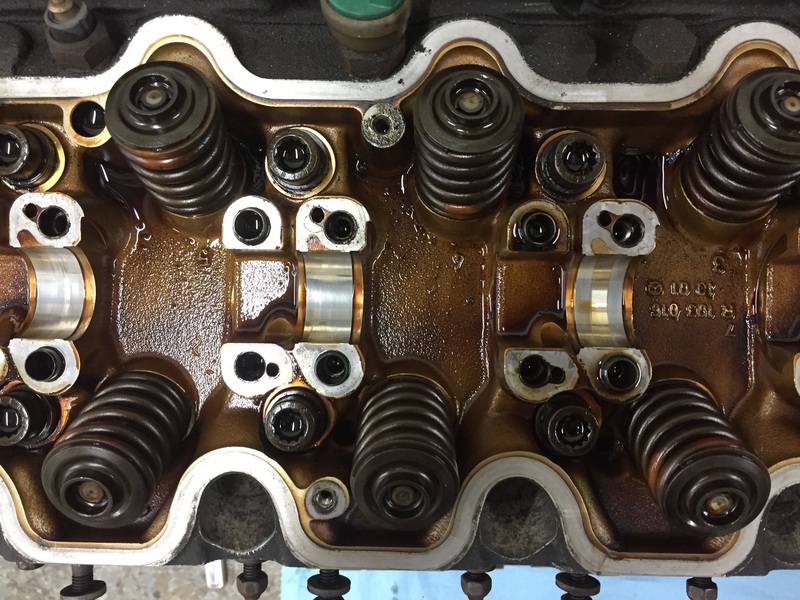 After pulling all the rocker towers and seeing that the camshaft and rocker arms were in pretty good shape, it dawned on me that I might be able to swap the newer hardened cam and rockers from this 2.6L into my 3.0L, and vice versa. Any reason I shouldn't swap the cam, rockers, and towers between engines? I've read that the cams are interchangeable, but I can't find profile specs on these two cams. 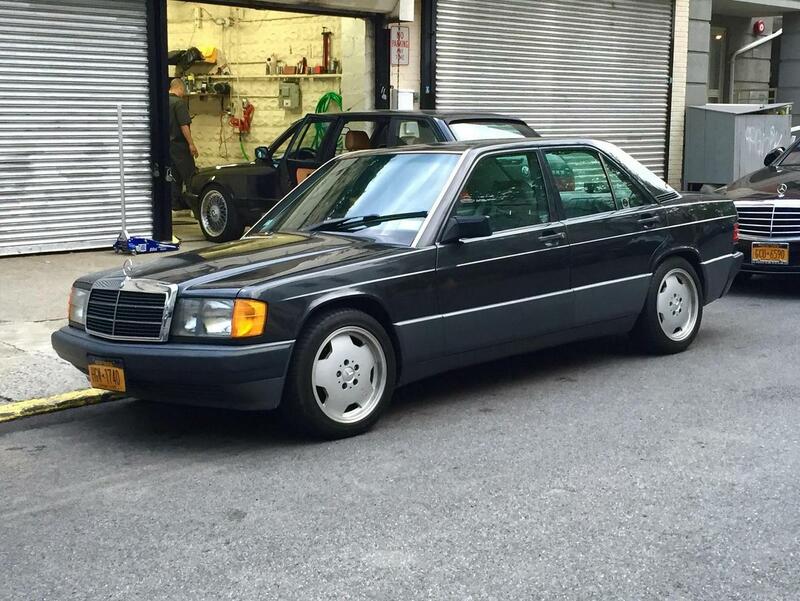 ('87 3.0L and 91 2.6L). 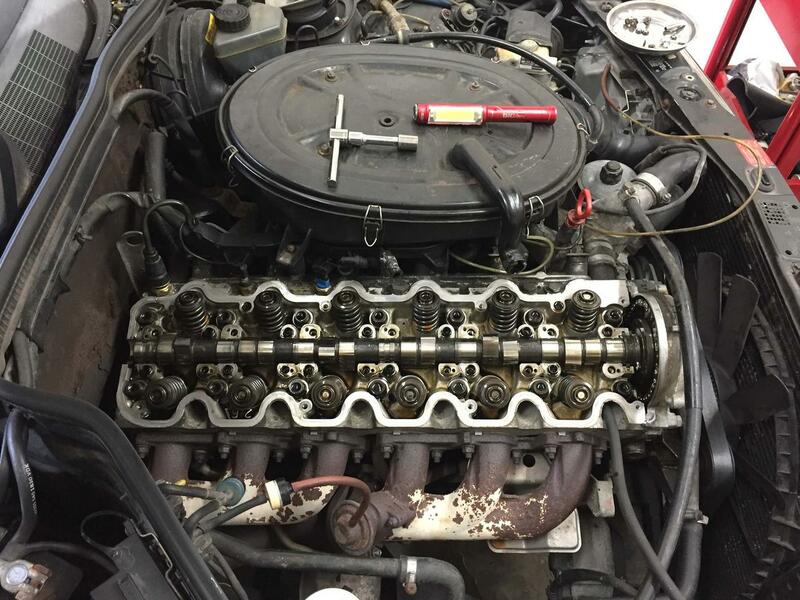 In the meantime I'll do the valve stem seals and check the valve springs to see if they're still in spec. Last edited by rolandtiangco; 07-30-2017 at 10:37 AM. Following up because why not. 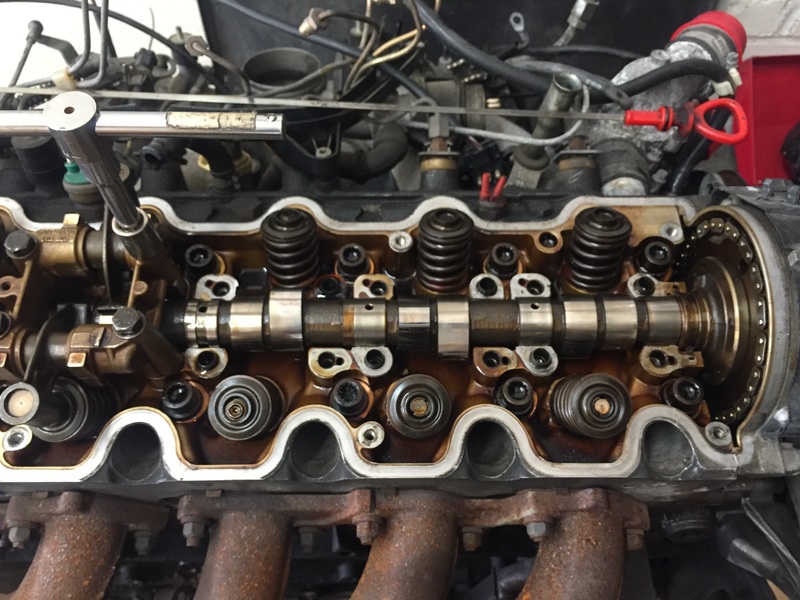 Turns out the cams are different between 2.6L and 3.0L engines so kept the 2.6L intact after the valve stem seals replacement, which went smoothly. Driving the car still and it’s great. 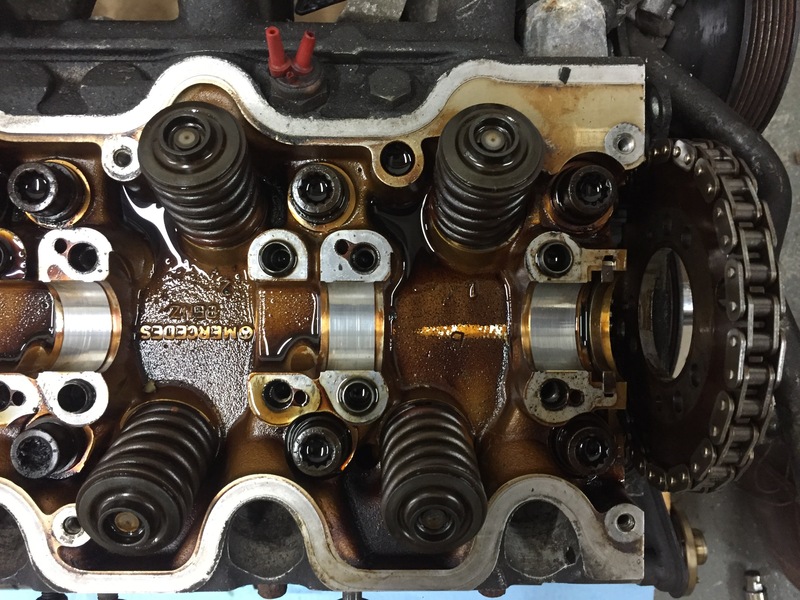 Sent the 3.0L head off to a machine shop for a valve job and unfortunately learned that the head was warped .016 which is too much warpage to resurface. 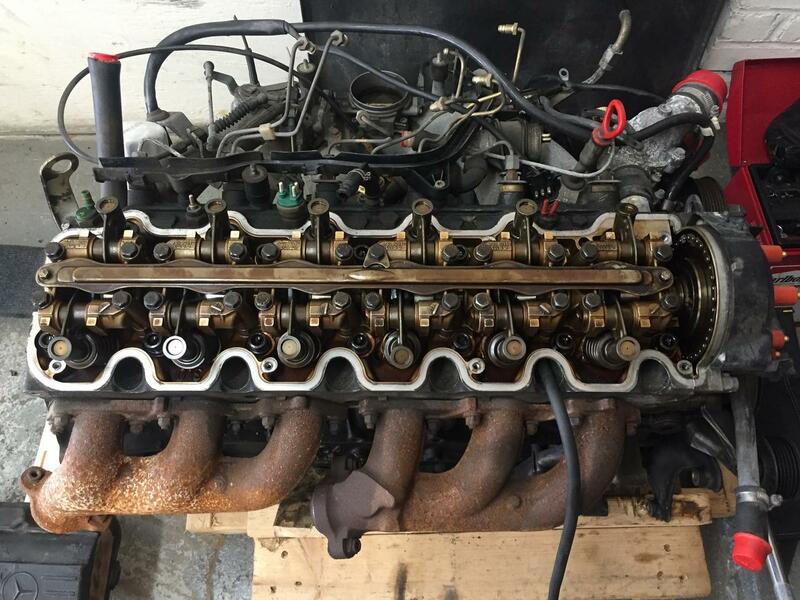 While searching for a new head I found an entire running engine for the cost of a used head. 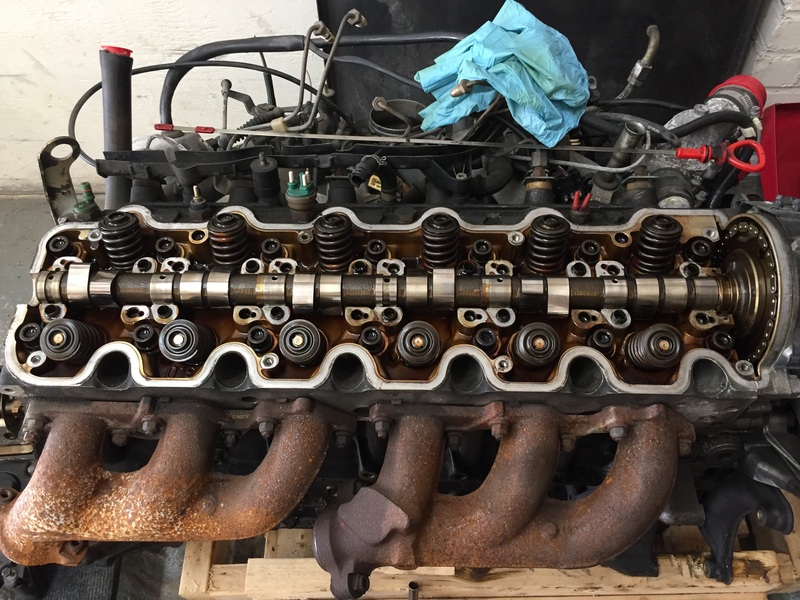 I’m now debating just bolting up the getrag to this new 3.0L or pulling the head to refresh it for the low mileage short block. In no rush so I’ll make progress in due time. I really appreciate the high res pics with local content, running a car shop in the big city. 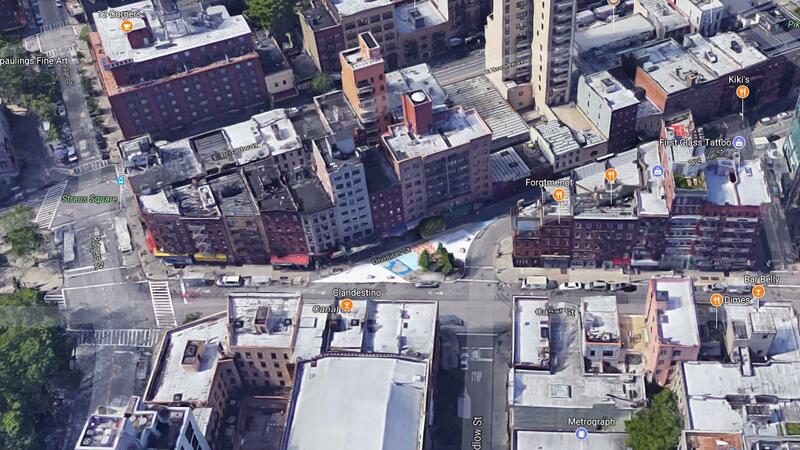 Background: I get around, have something like 35 countries stamped, and will typically scan neighborhoods of interest using Google satellite and street. 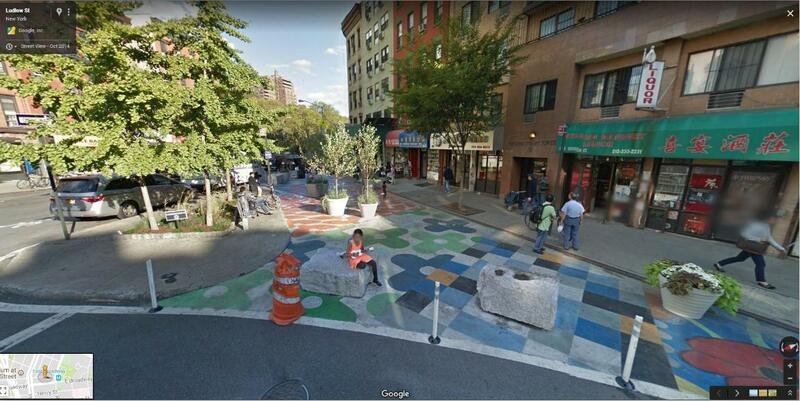 Across from your "reserved parking", I got a tickled by the mini-Tribeca at Canal and Division where you've got a permanent urban park going on. If I were to drop in, I think I would check out Brigitte at Ludlow.